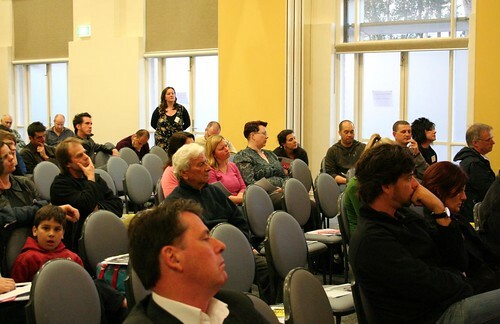 The HSC Candidates Conference was well attended by concerned parents and residents for whom the lack of a general entry high school in Coburg is clearly a vote changing issue in the upcoming State Election. We would like to thank all who attended on the night, including MC Shane Maloney who did a most able job in keeping the night reasonably civil. Even when discussions became somewhat heated. Our children's education is clearly something we value highly. 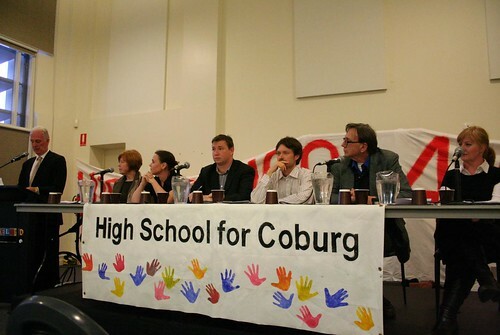 A full panel of politicians, mostly from the seats of Brunswick and Pasoe Vale, including Christine Campbell, Jane Garret, Martin Dixon, Trent Hawkins, Liam Farelly and Cyndi Dawes gave short speeches outlining their positions on the high school for Coburg issue. There were many questions from the floor and discussions continued at an individual level after the panel discussion was over. HSC intends to post more detailed candidate profiles summarising the position of each candidate based on what they said on the night of the candidates conference and in other media. Highlights of the candidates conference can be found on the youtube clip below. 1. 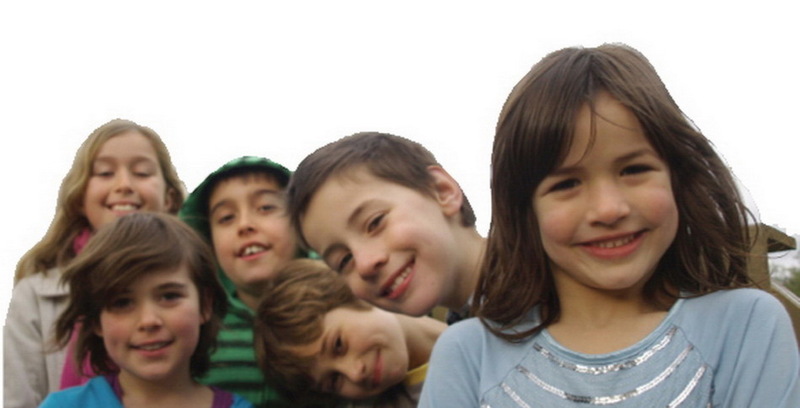 The DEECD report looking into secondary education provision in the Coburg area was released. Unfortunately there is no link to the report yet, but we'll let you know when there is. In spite of numbers being demonstrably too conservative, it still showed a huge shortfall in secondary education provision in our area. HSC had a crucial part to play in this report not being a white wash.
Primary enrolment numbers up three years in a row( including projected 2011). Shows no South -North travel to secondary school, so spaces in the north become irrelevant to HSC issue. Capacity shortfall for years 7-9 in schools to south: 837 at 2016 and 1,027 at 2021. Capacity surplus overall for years 7-12 but in schools to the south the shortfall is: 1,358 at 2016 (partially offset by space at Coburg Senior High School) and 1,689 at 2021. The Coburg area will generate 2,443 at state secondary by 2021 The average forecast demand generated by the Coburg area is 1.8 to 10 times more than that of surrounding school catchments. Executive summary doesn't include the additional 229 kids in Coburg /Brunswick who will require state secondary - from the updated new dwelling numbers provided by Moreland Council. 2. The Premier, John Brumby acknowledged the demand for state secondary in Coburg at the press conference for Brunswick High Regeneration. 3. Moreland Council hangs banner on council building "This community needs a high school". 4. The Age published this article on page 4 -"Northern Schools Full" and HSC spokeswoman Catherine Hall was interviewed on ABC radio. 5. We hosted the HSC Candidates Conference - a lively night attended by two primary principals, the Mayor and several councillors, the media and ofcourse the community and the candidates .Thanks to all who came. 6. 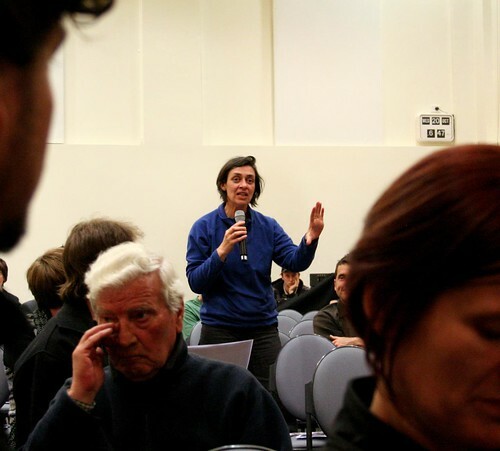 Member for Pascoe Vale, Christine Campbell announced a task force will be set up to work with the community to determine best method of implementation for increased secondary education provision for Coburg. 7. HSC BBQ at DEECD/Moreland Council funded Kids Day Out next to Coburg Leisure centre -weather not great but still sold lots of snags, got lots of support and interest from the many families attending the fun day. 1. HSC will seek and provide more clarity on some of the above over next few days. 2. HSC will provide brief response to final report to Bronwyn Pike's advisor - hopefully enabling her to make an announcement. 3. 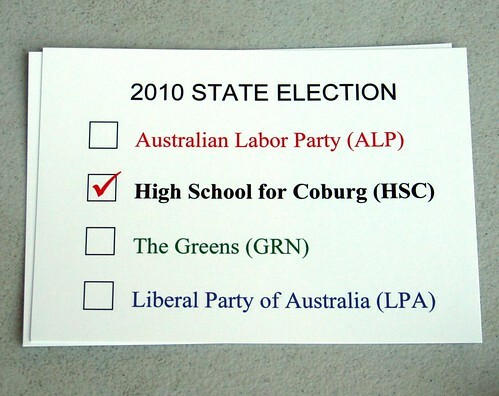 HSC will also seek strong commitment ( before the government goes in to caretaker mode) to provision IN Coburg during the next government term. Follow the link to download a copy of the flyer for the HSC state election conference. Our chance to question all the candidates about where they stand on this crucial issue. This Wednesday night, 20th of October at Coburg Concert Hall from 7.00pm to 9.00pm. Spread the word! As an aside, there are other schools similar distances away but these were not mentioned in Minister Pike’s letter. These include Princess Hill (zoned), Northcote (apparently over capacity) and Thornbury (apparently told by the Department of Education to raise its cap from 800 to 1200 because Northcote is over capacity and will be capped in 2012). Minister for Education Bronwyn Pike states “Education is the Brumby Labor Government’s number-one priority” but if you live in the Coburg area you would be hard pressed to find evidence of this statement. In this broader area we have seen seventeen secondary schools closed down or merged in the past eighteen years. The result in our area is that kids have to move around to find a secondary school, and this is what the government wants. Their policy has made education a free market like trade or economics but they obviously aren’t the same. Education is about children, lives and families. Education is not money or a trading commodity and can’t be treated the same way. The government thinks competition between schools will improve the system, and making parents move around to find a school will force schools to get better in order to attract students. So will I send my boys to the schools available near here? Stephen Lamb, Associate Professor in Education at University of Melbourne, who researches education issues found that people who have to travel to send their children to a secondary school travel to a school in an area with a higher socioeconomic status. This is logical. If you have to travel to take your kids to school, you aren’t going to travel to an area where the perception is that schools are funded less and students achieve poorer results. Unfortunately these schools tend to be in areas of lower socioeconomic status (SES). 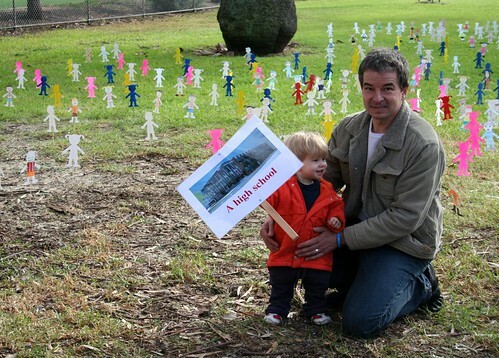 Mr Lamb’s findings show schools started out equal across all SES areas but after the Government introduced its policy of forcing students to travel, the schools in areas of high socioeconomic status have gotten bigger and receive more funding and can offer more choice, while the schools in areas of lower socioeconomic status have gotten smaller and receive less funding and their options become limited. It’s creating a two tiered education system. The bigger schools get the choice of high achiever students who are travelling to find an education while the smaller schools don’t have this choice. I will be joining the ranks of parents who send their children to a school where they believe their individual needs will be met and where they think will get the best education. Darren Saffin is member of the HSC working group. 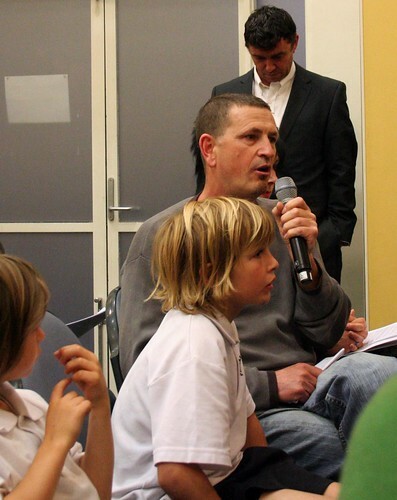 He lives in Coburg with his wife and two small sons. In his "free" time, he handles our media. This is his personal story about how the lack of a general entry high school will affect his family. If you would like to tell your story please email us at highschool4coburg@gmail.com .